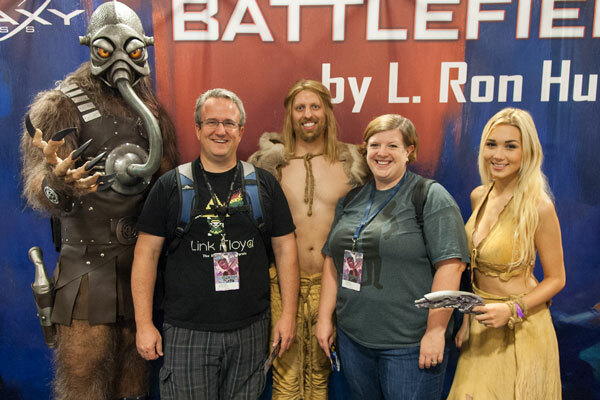 The main characters from the 21st Century edition of Battlefield Earth: A Saga of the Year 3000 by L. Ron Hubbard came to life at Dragon Con 2016. 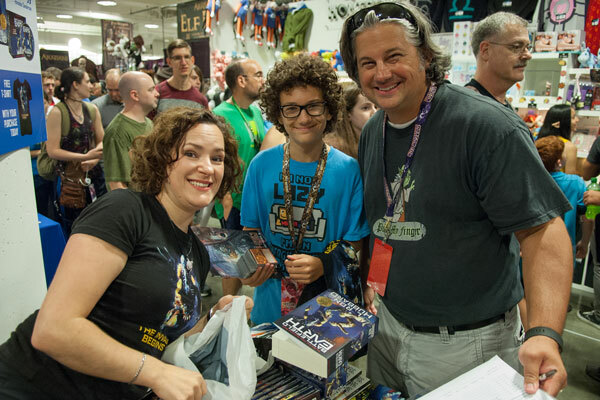 Terl, the evil alien Psychlo security chief over Earth and main antagonist of the novel was joined by the story’s heroes, Jonnie Goodboy Tyler and Chrissie, in the annual Dragon Con parade and later at the Galaxy Press booth. Tens of thousands of Dragon Con guests and public lined the bright and sunny streets of Atlanta to watch the annual parade. 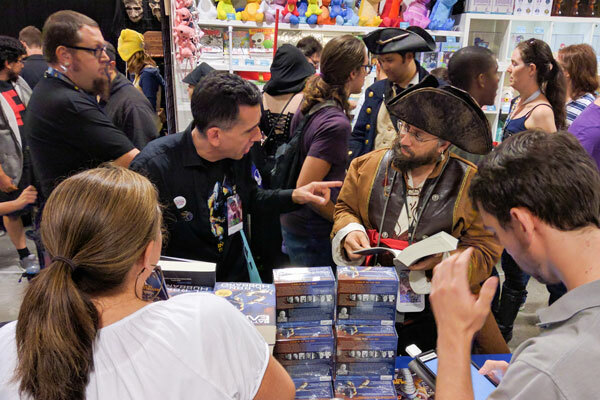 The crowds cheered as the evil Terl, making his Atlanta debut, was escorted by his captors-and the novel’s heroes-Jonnie Goodboy Tyler and Chrissie. Leading the way for the trio was a professional bag piper representing the Scots who play a significant role with Jonnie in the fight against the alien race of Psychlos to take back the planet. Following the parade, the entourage visited the Galaxy Press booth, which rapidly packed out with fans wanting their photos taken with the characters. The beautiful Chrissie was performed by actress Cheyanna Lavon Zubas (Guardians of the Galaxy Vol. 2). 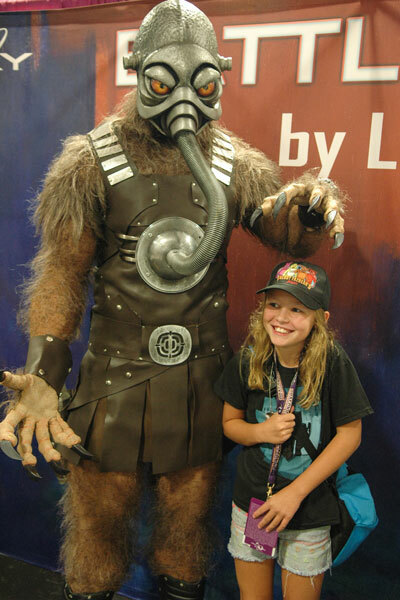 Terl was performed by Nate Andrade (Goosebumps – Monster). Sales throughout the three-day weekend were record setting for any event to date. Books-a-Million staff were on hand in the booth and helped with the brisk sales. 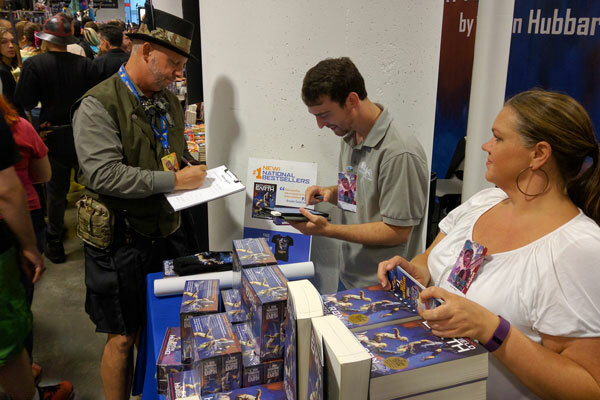 Our own Galaxy staff were giving out copies of Battlefield Earth posters and Terl T-shirts to fans who bought their copies of the book and audiobook. The poster and T-shirt features the cover art from the new edition of the book by the legendary illustrator, Frank Frazetta. 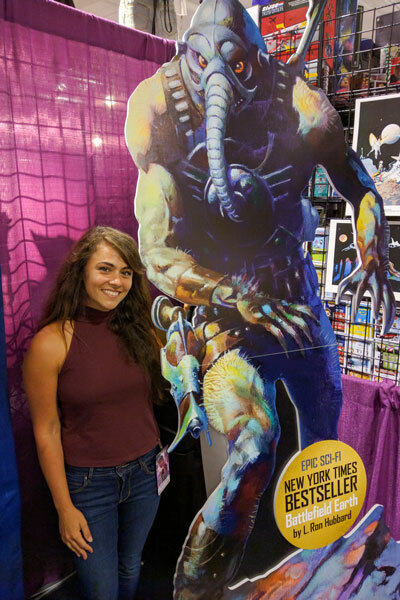 Sara Frazetta, Frank’s granddaughter who was also attending Dragon Con, stopped by the booth to say hello and get her picture with the imposing 8-foot-tall Terl from Frazetta’s cover art. Battlefield Earth was written by L. Ron Hubbard in 1980 in celebration of 50 years as a professional writer. It rose to the top of national bestseller lists, eight times on the New York Times bestseller list and went on to be recognized in 2000 as #3 of the top 100 favorite fiction novels of the 20th century in the Modern Library Reader’s Poll. The epic sci-fi adventure novel was re-released earlier this summer as both a trade paperback and unabridged multi-cast audiobook (47 hours with 67 actors performing 198 roles). 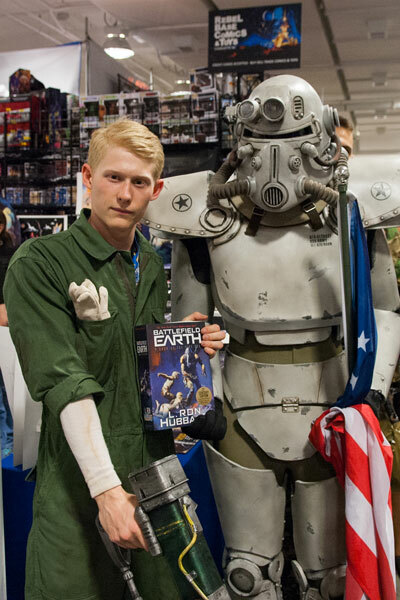 And with its extreme popularity as one of the all time favorite science fiction novels, it hit the #1 spot in America in three separate categories as announced by Publishers Weekly: Science Fiction, Paperback and Audiobook.